The following interactive presentation will explore the various lab testing used in the diagnosis of systemic conditions that have associated manifestations in the eye and ocular structures. Common ocular conditions and the associated systemic diseases will be reviewed with an emphasis on what tests should be ordered and what the optometric physician should know once the results are back. This presentation provides necessary understanding of the signs and symptoms that accompany various types of neurogenic diplopia. An additional goal is to understand possible systemic implications and appropriate medical testing for patients presenting with diplopia. This course details in a case based format the diagnosis of patients presenting with diplopia. A diagnostic algorithm is presented to allow the audience member to follow the clinical findings to an appropriate differential diagnosis with emphasis on pertinent neuroanatomy and potential causative factors. Current therapeutic management and appropriate diagnostic testing is heavily emphasized and key points are reinforced with easy-to-remember 'Odes'. 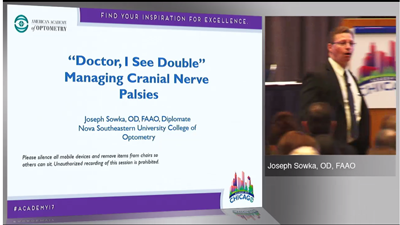 In order to receive distance learning credit for this course, please view it at https://learning.aaopt.org/products/doctor-i-see-double-managing-cranial-nerve-palsies-credit. Dr. Sowka is a Professor of Optometry at Nova Southeastern University College of Optometry where he serves as Chief of The Advanced Care Service and Director of the Glaucoma Service at the College’s Eye Institute. He is also Chair of the Department of Optometric Sciences. He is the longest tenured faculty member at the College. Dr. Sowka is a founding member of both the Optometric Glaucoma Society and Optometric Retina Society. He is formerly the Vice President of the Optometric Glaucoma Society and is currently the President of the Optometric Glaucoma Society Foundation. He is also the Vice Chair of the Neuro-Ophthalmic Disorders in Optometry Special Interest Group for the American Academy of Optometry. Dr. Sowka is a Glaucoma Diplomate of the American Academy of Optometry. He is the lead author of the annual Handbook of Ocular Disease Management published by Review of Optometry. Multimodal imaging brings together information from spectral domain ocular coherence tomography (SD-OCT) and confocal scanning laser ophthalmoscopy (cSLO) imaging. Combined, these imaging strategies open the door for new and exciting evaluative techniques of the retina and choroid by optometrists. 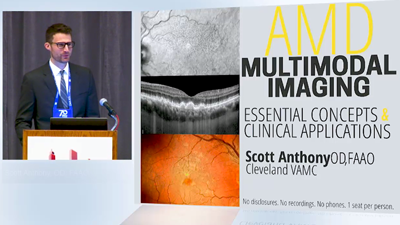 This course offers an in depth review of multimodal imaging findings and diagnostic strategies for the full spectrum of age-related macular degeneration disease. Dr. Anthony practices at the Cleveland VA Medical Center and is the Chief of the Optometry Section. He graduated from The Ohio State University College of Optometry and completed his Ocular Disease Residency at the Brooklyn/St.Albans VA.
Dr. Fanelli is originally from suburban Philadelphia, and attended the Pennsylvania College of Optometry, where he graduated in 1985. He has been in private practice since that time in coastal North Carolina, specializing in ocular disease management. He has lectured around the country at state and national meetings on a wide variety of topics dealing primarily with advanced diagnostic and therapeutic modalities. He has developed a course for certifying OD’s in the use of injections in primary eye care that has been used by several states, and which was required for licensure renewal of North Carolina optometrists. 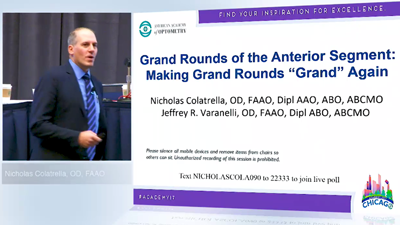 Dr. Fanelli is a Contributing Editor for Review of Optometry, and is the author of the bi-monthly Glaucoma Grand Rounds column. He is a past President of the North Carolina State Board of Examiners in Optometry. He is also a past Trustee of the North Carolina State Optometric Society, where he served as Continuing Education Chairman. He serves as chariman of the EyeSki Optometric Conference and the CE in Italy Conference. He is an adjunct faculty member of the Pennsylvania College of Optometry and Western University of Health Sciences. Leonard V. Messner, OD, FAAO, is the Vice President for Patient Care Services of the Illinois College of Optometry and serves as the Executive Director of the Illinois Eye Institute. Dr. Messner holds the rank of Professor at the Illinois College of Optometry. 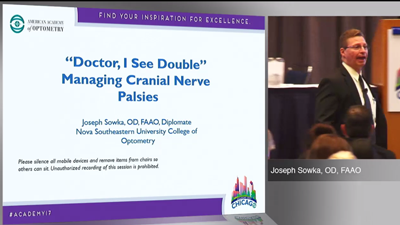 He currently serves as the chair of the Neuro-Ophthalmic Disorders Special Interest Group of the American Academy of Optometry, co-chair of the Chicago Concussion Coalition and steering committee member of the AAO Fellows Doing Research Special Interest Group. He is a member of the Vision and Concussion Research Committee of the North American Neuro-ophthalmology Society. His principle area of research involves the study of vision, visual-motor and ocular structural abnormalities with concussion. Lorraine Lombardi is Associate Professor, Associate Dean for Faculty Affairs, Interim Dean/ College of Health Sciences, Salus University. She teaches Neuroscience and Gross Anatomy at the Pennsylvania College of Optometry (PCO). Dr. Lombardi holds a Ph.D. in Anatomy/Neuroanatomy from Hahnemann University School of Medicine in Philadelphia. She has been awarded “Educator of the Year” multiple times. In 1995, she received PCO’s Presidential Medal of Honor, for outstanding service to the College and Optometry. She is a frequent lecturer nationally and internationally on the basic science of neuro-ophthalmic disorders. Every year the FDA approves numerous pharmaceuticals for the treatment of diseases in various medical therapeutic areas. This course will review the recently approved pharmaceuticals that are pertinent to optometric patient care. Pharmaceuticals covered will include but not limited to endocrinology, cardiology, vascular disease, infections, neurology, optometry, psychology, and urology. Indication of use, mechanism of action, and/or ocular side effects will be reviewed. This course is given by an optometrist and a Doctor in Pharmacy. 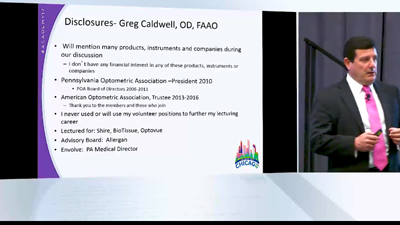 Greg Caldwell, O.D., is a 1995 graduate of the Pennsylvania College of Optometry. He completed a one-year residency in primary care and ocular disease at The Eye Institute in Philadelphia Pennsylvania. He is a fellow of the American Academy of Optometry (AAO) and a Diplomate of the American Board of Optometry (ABO). He currently works in Duncansville, PA as an ocular disease consultant. Dr. Caldwell’s primary focus is the diagnosis and management of anterior and posterior segment ocular disease and he has been a participant in multiple FDA investigations. Dr. Caldwell has lectured extensively throughout the county and over twelve countries internationally. In 2010 he served as President of the Pennsylvania Optometric Association (POA) and served on the AOA Board of Trustees 2013-2016. He is President of the Blair/Clearfield Association for the Blind. Dr. Offerdahl is a graduate of Temple University School of Pharmacy and is currently an assistant professor at Salus University. She completed a residency in pharmacy practice at Temple University Hospital. She has held faculty positions at Salus University, University of the Sciences in Philadelphia and Philadelphia College of Osteopathic Medicine. Dr. Offerdahl has a clinical practice outside of Philadelphia and is currently doing additional training in veterinary pharmacology and integrative medicine studies, including homeopathy and herbals. This one hour course will review various cases of the anterior segment and specific treatment and management options. Each case will be supported by clinical photographs and / or videos to enhance the learning and discussion, along with audience participation using an interactive digital polling process. Patient adherence with topical medications is less than desirable, and this course will discuss how to get the bottle out of the patients hands. 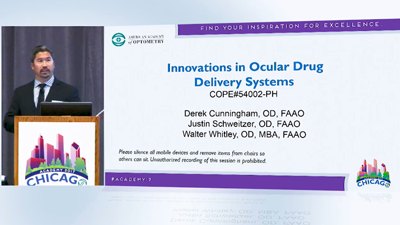 This course will focus on current and future advancements in ocular drug delivery systems. 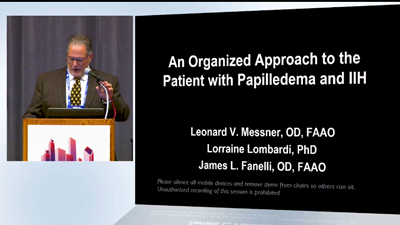 This discussion will include the impact these technologies have on the management of various ocular conditions. Topics will include drug vehicles, pharmaceutical contact lenses, punctal plugs, surgical devices and delivery, and nanotechnology. Dr. Justin Schweitzer specializes in advanced glaucoma, refractive surgical clinical care, and anterior segment pathology at Vance Thompson Vision in Sioux Falls, South Dakota. He graduated from Pacific University College of Optometry in Forest Grove, OR. He spent six years in private practice optometry and decided in 2012 to pursue his dream to focus on glaucoma, advanced anterior segment surgery care and pathology. He completed his residency at Vance Thompson Vision in 2013. Dr. Schweitzer is a member of the Optometric Glaucoma Society, a Fellow of the American Academy of Optometry, Scleral Lens Education Society, AOA, Intrepid Eye Society and South Dakota Optometric Association. Dr. Schweitzer has had multiple articles published and has delivered lectures on glaucoma, anterior segment pathology, refractive surgical clinical care and surgical management. Walter Whitley, OD, MBA, FAAO serves as the Director of Optometric Services and Residency Program Supervisor at Virginia Eye Consultants in Norfolk, Virginia where his practice encompasses ocular surface disease, glaucoma, surgical co-management, clinical research and the supervision of an extensive referral network. 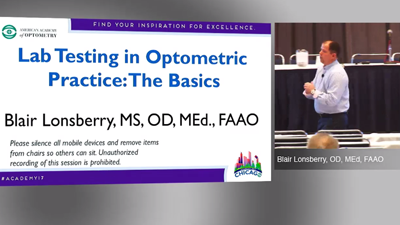 Dr. Whitley is a nationally recognized author and lecturer on topics ranging from ocular disease, surgical co-management and practice management topics. He serves as Co-Chief Medical Editor for Collaborative Eye and contributing editor for the Review of Optometry and Optometry Times. Dr. Whitley is actively involved with the local, state and national optometric associations serving as the president elect and the education co-chair for the Virginia Optometric Association. In 2012, he was named the Young OD of the Year for the Virginia Optometric Association. Dr. Cunningham is the Director of Optometry and Research at Dell Laser Consultants in Austin, Texas. He is a founding member and chair of the Integrated Ophthalmic Managed Eyecare Delivery Task Force by the American Society of Cataract and Refractive Surgery. He is the chief medical editor of Optometry’s only pathology based publication – Advanced Ocular Care. He is also the author of The Surgical Minute column in Review of Optometry and the host of Innovations in Clinical Practice video series on Eyetubeod.com. Previously, Dr. Cunningham was the resident education supervisor at the Division of Ophthalmology, Texas Tech School of Medicine at El Paso.